But What Do I Do With Those Dress Pins? For anyone who follows me on Facebook, my Etsy shop, or in my actual shop, you probably already know that one of my big selling items is dress pins. I have been getting enough questions about these pins lately that I decided it was time to write another blog about them. I originally wrote a basic blog about dress pins a couple of years ago, called Pins, Pins and More Pins, and another called Authentic Dress Pins about the fact that we make spiral headed dress pins. Now I do make the early period dress pins that are three to five inches long – the kind that are usually used to clothes shawls and brats and such. But right now I am talking about the small wire spiral headed dress pins that appear in the archaeological record in the 1200’s and are made the same exact way solidly into the Victorian era. For those who may not be certain exactly what I am talking about, here is a picture of the two sizes of dress pins that I sell in my shop. In pre-1600 Europe they came in a virtually infinite selection of sizes, from really short (about 3/4 of an inch) to ridiculously long (three or four inches long), but these two sizes seem to work for most people. And here is a link to some pre-1600 pins that were found in Great Britain. They find thousands of these all over Europe. So the most common question that I am asked is, “what are they used for?” And my semi-wise-guy answer is: holding your clothes together. This is actually an understatement, since they are used for holding clothing, hats, veils, and just about any other dress accessory that you can think of in place. How do we know what pins were actually used for? Well, they show up in inventories, but they also show up in a fair number of paintings and portraits. The earliest portrait that I could find is dated to about 1410 – A Portrait of a Lady. If you zoom in on her head coverings there is no attempt to disguise the use of pins to hold everything in place. 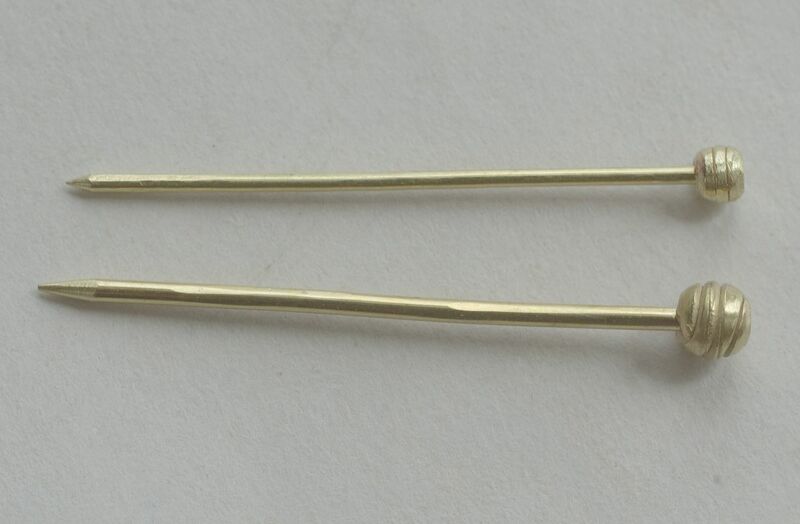 I should mention, that several people have told me that men also used these dress pins to hold their clothing in place. I have not spent a lot of time actually looking for pins in men’s portraits, but so far I have not found any. This does not, of course mean that they did not use pins, only that they did not either show, or that the artists did not paint the pins into the portraits. The Portrait of Marie de Pacy (1425) also clearly shows the use of pins, a fancy one in the middle and many smaller pins on other parts of her headcovering. The Master of Flémalle painted the Merode Alterpiece in 1427 and this detail of the left wing of the alterpiece shows a woman with several pins in her headpiece. A couple of years later he painted a Portrait of a Woman (1430) which shows several pins being used to hold a lady’s complex, multi-layered veil system in place. Next time we will look at a couple of very prolific artists and some of the things that they showed pins being used for! This entry was posted in Dress Accessories, Research, SCA Life and tagged dress pins, dress pins in paintings, dress pins in portraits, Medieval dress pins, Pins, using dress pins by Eirny. Bookmark the permalink.